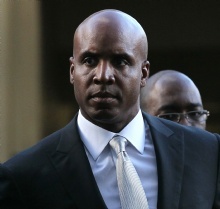 Barry Bonds is a famous Athlete from USA, he is 54 years old and still alive, born July 24, 1964. Barry Lamar Bonds (born in Riverside, California) is one of the players on the baseball team San Francisco Giants. He is the son of former star Bobby Bonds, and a distant relative of Reggie Jackson. He is born under the zodiac leo, who is known for Ruling, Warmth, Generosity, Faithful, Initiative. Our collection contains 22 quotes who is written / told by Barry. "My career is an open book, but my life is not"
"But to be the best, you must face the best. And to overcome your fear, you must deal with the best"
"I never stop looking for things to try and make myself better"
"I don't know what you guys say, but at home, life is way different from baseball"
"I don't know what my future is"
"When I finish playing, I think I'd like to coach college baseball"
"There is nothing better than walking out and hitting a home run"
"I'm not afraid to be lonely at the top"
"I like to be against the odds"
"Those boos really motivate me to make something happen"
"I think everyone needs to be a role model, period"
"I have a chef who makes sure that I'm getting the right amounts of carbs, proteins and fats throughout the day to keep me at my max performance level"
"Every pitcher can beat you, it doesn't matter how good you are"
"It's called talent. I just have it. I can't explain it. You either have it or you don't"
"I was born to hit a baseball. I can hit a baseball"
"I don't want to be a Major League coach"
"I'd like to help educate kids about the Major Leagues - what to anticipate, what to expect, what they'll need to do to prepare themselves"
"I think some of the pressure comes from the expectations of other people. Like if your father played baseball, they expect you to be the big lifesaver or something when you play a sport"
"Everyone in society should be a role model, not only for their own self-respect, but for respect from others"
"Young players need to know how to take care of themselves for life after baseball"
"It's not the name that makes the player. It's the player"
"Baseball is just my job"